In all the years I've been traveling South Dakota, there is one critter that I have not been able to capture what I'd call a "good" photo of. I've seen a few jackalopes, but they always seem to see me first and don't stick around long enough for a picture. 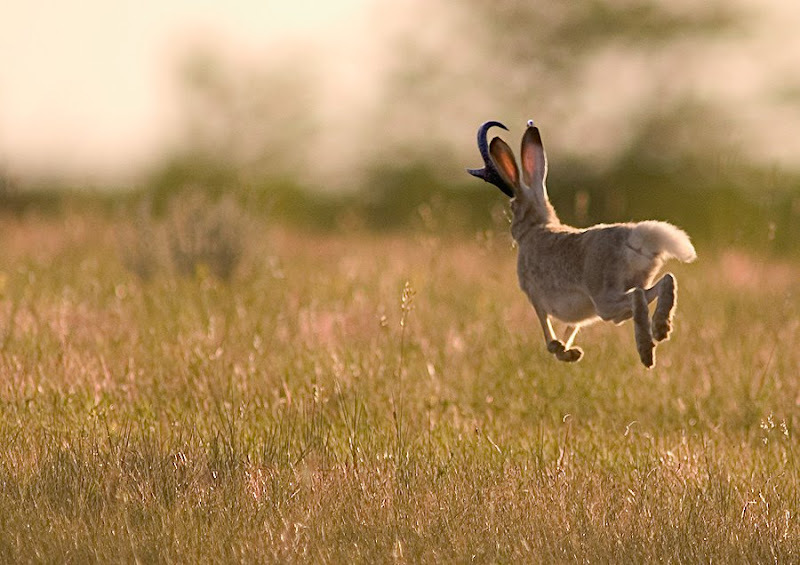 These sneaky crossbreeds between jackrabbits and antelope or deer are most often spotted "West River." 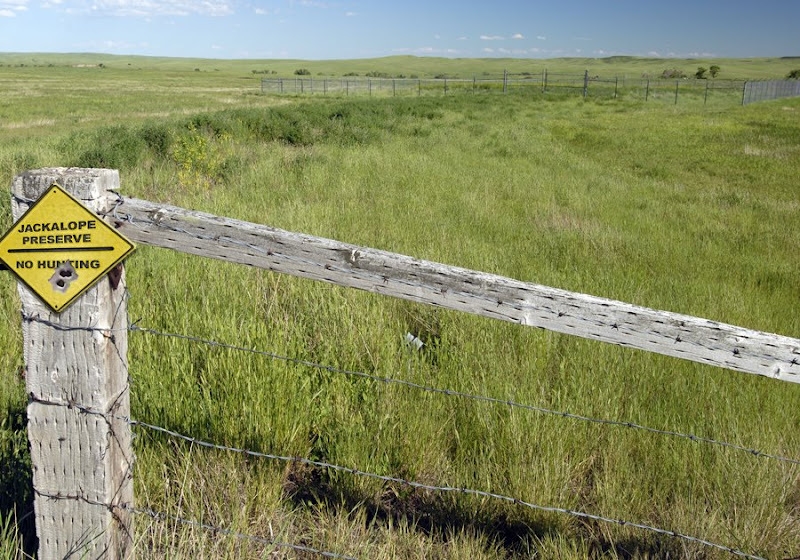 It seems that they mainly dwell on the grasslands between Murdo and Rapid City. This one almost let me get a clear shot near Cactus Flat, but was just too quick. Even hanging around the small fenced in preserves found scattered throughout the area around Ellsworth Air Force Base has not yielded a cooperative jackalope. These preserves were established in the 1990s when the jackalope population began to dwindle. Best as I can tell, they have made a great comeback. 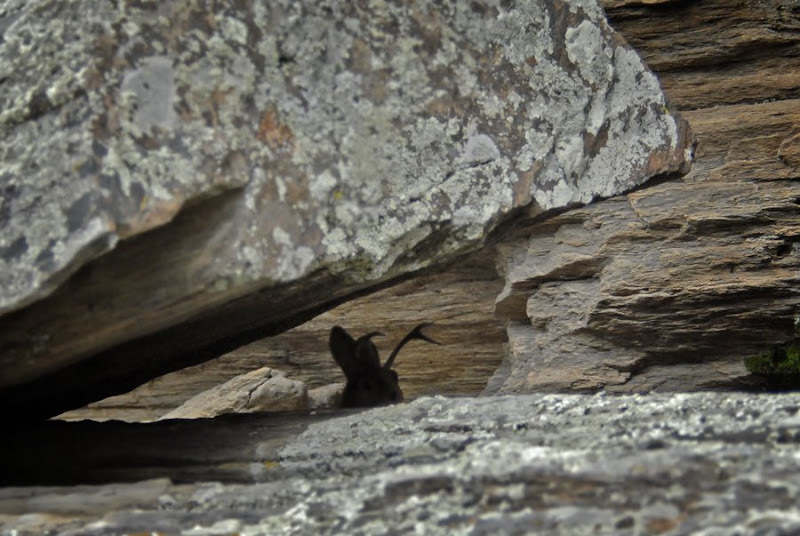 I have seen the even more rare rock-dwelling variety in the area near Horsethief Lake west of Mount Rushmore, but they seem just as shy as their prairie cousins. 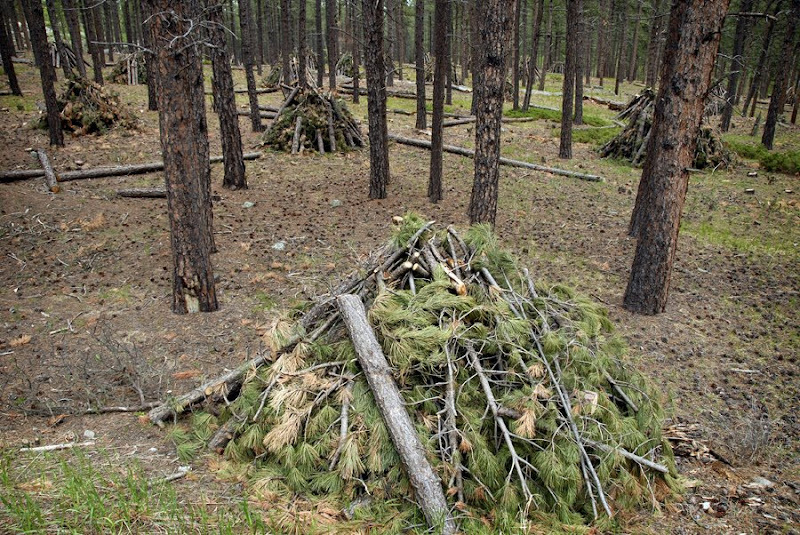 While traveling through the Black Hills, I have come across these strange piles of wood and brush in many areas. Friend and fellow photographer Scott Howard explained to me that he believes these to be jackalope mating huts, where very secretive reproductive rituals are performed. 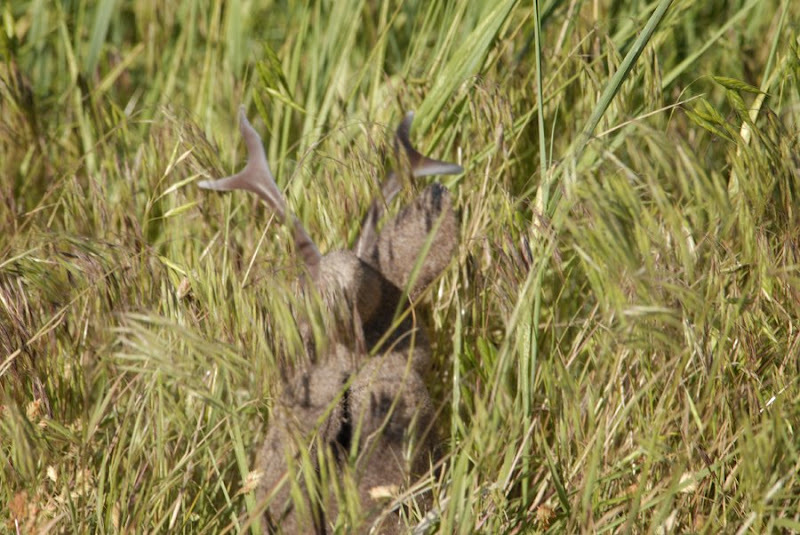 I consider myself lucky to have observed one of the antelope-horned variety in a grassy pasture near Ottumwa last year and got the best shot I've been able to catch so far. 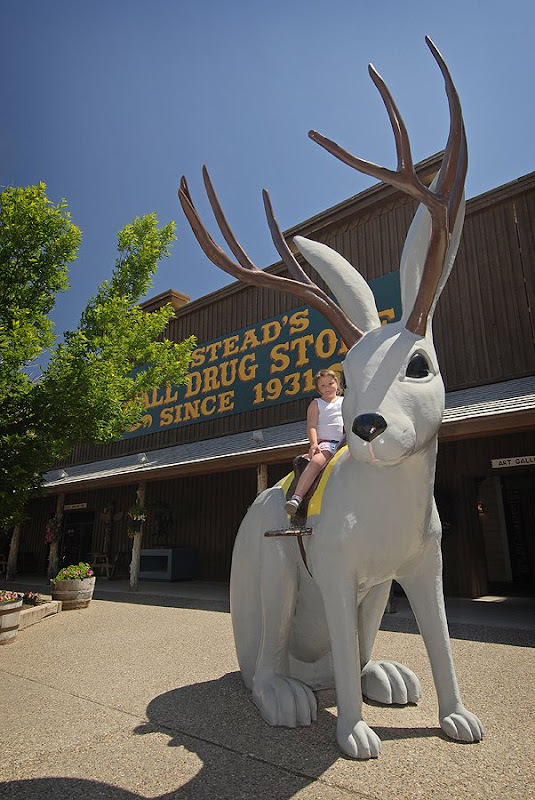 If you are interested in the evolution of these wonderous creatures, Wall Drug has created a lifesize replica of the prehistoric ancestor to modern jackalopes - the amazing Giganto Jackalopithicus. 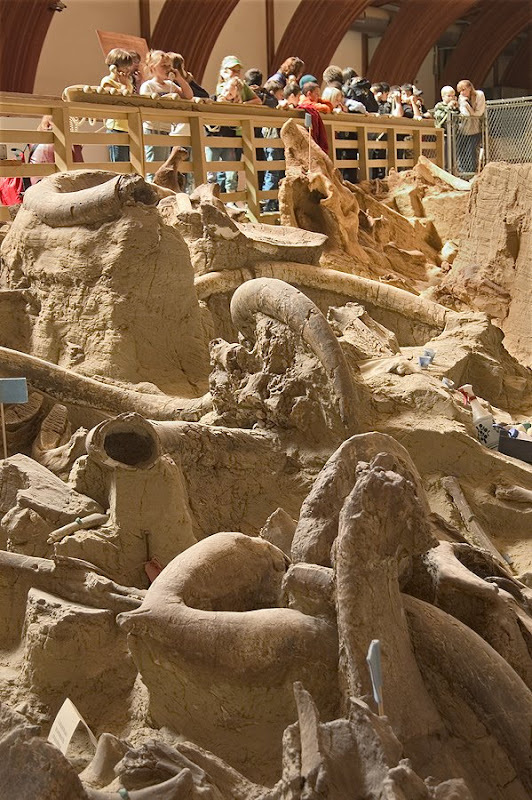 I have not been able to confirm it yet, but I've heard that some "Giganto" bones have been found mixed with other animals at the Mammoth Site archeological dig in Hot Springs. So if anyone that reads this has been able to capture a good clear shot of a jackalope that can be authenticated, please post a comment here. I will put you in touch with the proper authorities. Much more information about jackalopes can be found here, but I'm not responsible for the accuracy. By the way - APRIL FOOLS! Those little critters are elusive. I know when I worked at Wall Drug there was a big population of them in the area. One especially dry summer, they'd come into town pretty regularly, presumably to get a cold drink. They started to scare away the tourists, so the town would blow the jackalope attack siren, and people would work together to shoo the little critters back to the grasslands. At least that's what we told the tourists when they'd ask what the siren was for. That usually happened right at noon. Wonderful shots. I understand how difficult they are to shoot, but you make it look easy! This is actually the best compilation of jackalope shots I've seen. Well done, Chad! Thanks everyone, glad you enjoyed it. An excellent compilation of data. The photo of the "nesting" areas is very compelling. I have often seen these piles of wood, commonly referred to as slash piles created by loggers. It is my understanding that the concept of slash piles is a myth - perpetuated by fish and game officials, to protect the future of the agile jackalope.